I remember the days when my youngest baby's grins were toothless, and my oldest and I would wait and wait for his "toofers" to come in, as he called them. Long enough time ago, now he's a bit sassy and him and his mouth full of pearly whites says things like: I "arm" going to do it myself and "we gonna go water "sishin". 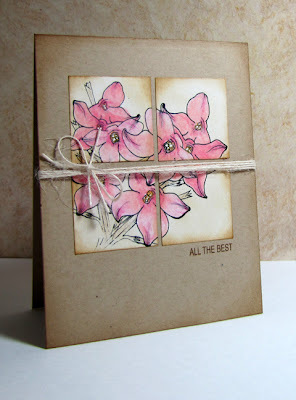 But I digress with those fond memories.... Today I have two cards to show you for two challenges, thus a "two-fer". 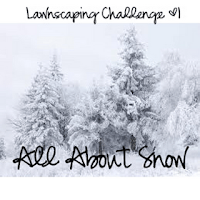 This first card is a CASE of this card by Kelly Marie for the new Lawnscaping Challenge! I kept the layout and even the patterned paper the same, but switched out the sentiment and image. 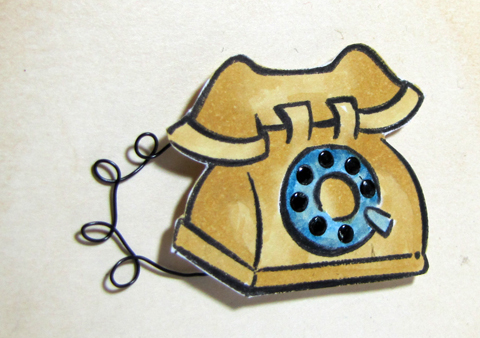 The phone has a wire cord and enamel buttons. 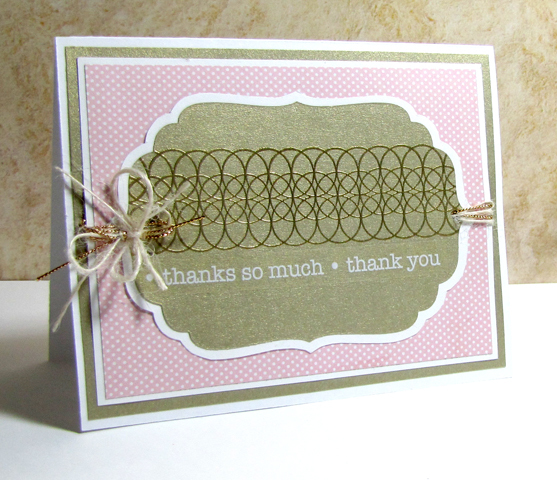 Thanks to this challenge, I learned a lot of tips from Kelly's video that she posted about the CASEd card. 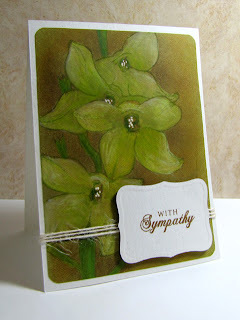 This next card is a CASE from Carly's at Paper in Bloom for the latest Waltzingmouse Stamps Release Party Contest. I really liked how Carly incorporated a fabric medium so I tried my hand at some cut canvas that I distressed with ink. 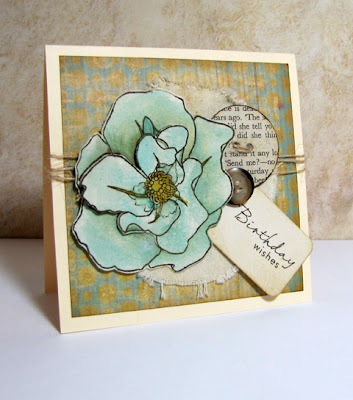 I was also inspired by the layering of the stamped rose that some members did for Claire's Birthday Blog Hop, so I included that technique to my card as well. Whew! This monochromatic card marks the final challenge for me for Moxie Fab World's Color Inspiration for Card Maker's Week and thus the most personally difficult in terms of color. 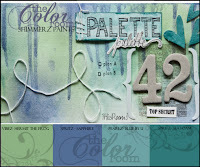 So happy that I stuck with creating something for all six color schemes! 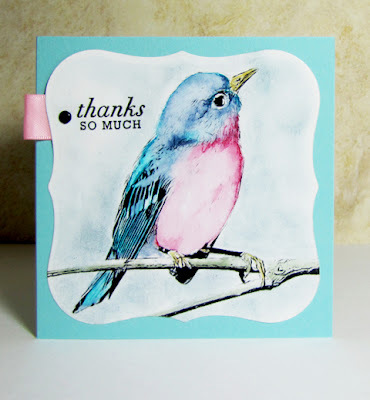 I am not exposed to much pink in my house and it extends to my craft area so I search high and low for solid colors that matched the swatches. (I think I might have blown about ten inches of dust off each paper piece.) 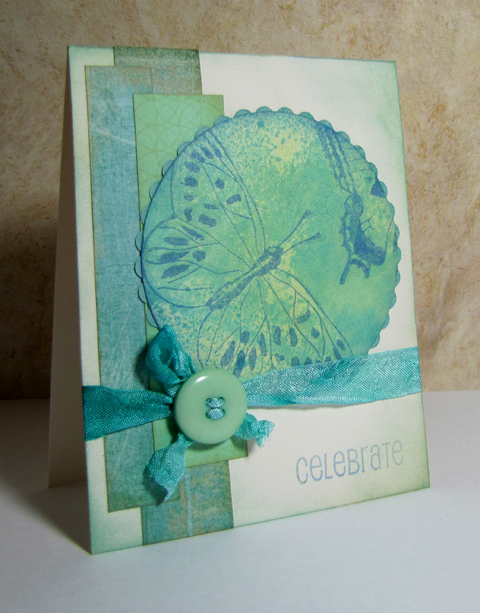 I also resisted the urge to pile on the frills and layers that I usually associate with this hue and kept it clean and simple with a few stamps from Furnishing Fun by Schlosser Designs. Stepping out of my comfort zone is a quite intimidating but I know if I want to grow and journey on the route of self achievement, then I feel the need to do it. I'll just take little steps. Little steps, like the colors of purple and teal. 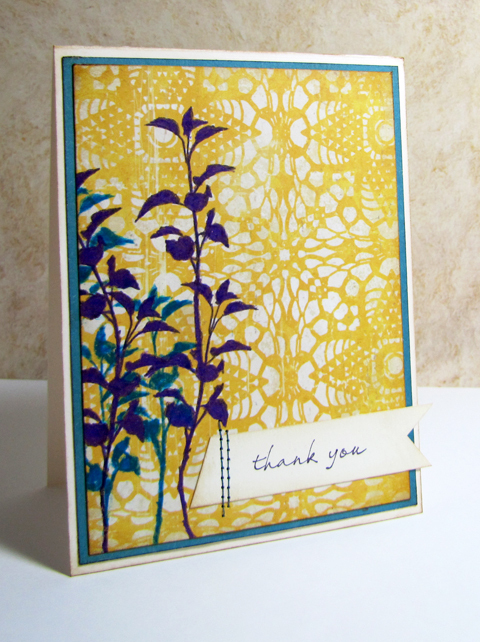 Little steps, like patterned paper. And little steps, like completing all of the Color Inspiration for Cardmakers' Week issued at MoxieFab World. 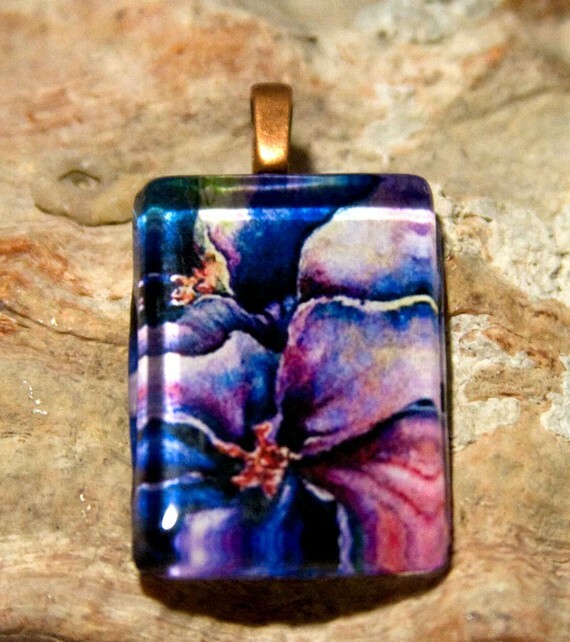 This is my second to last, an entry for Jewel Tones combination. 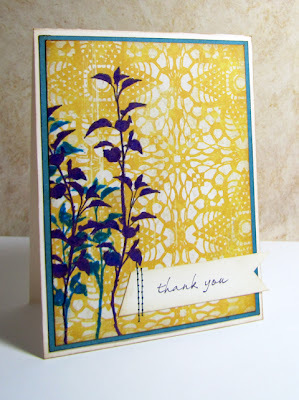 Dana issued a fantastic challenge for Yvonne's Guest Designer's Challenge, so I took a slightly larger step by stamping directly onto the patterned paper. I feel like I put on a few wandering miles during this leg of my journey, yet went back on track with a clean design. Neutral. Not happy, not sad. Not chatty, not mute. Just neutral this week. Good things and bad things have all tumbled together these past few days to make me feel, well, you guessed it, kinda neutral. Which is why tonight is a good tie to post my card for Moxie Fab World's Color Inspiration for Card Maker's Week: Neutral Challenge. 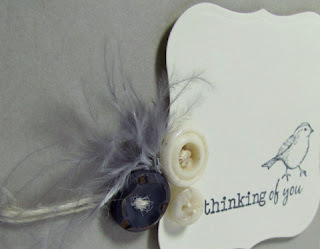 I am smitten with the vintage buttons (thanks to my fabulous sister, Heather) and the spattering of feathers (thanks to my handsome husband). 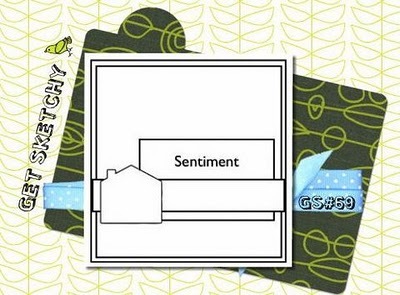 Using feathers helps to Extend the Background of my sentiment panel- a fabulous tip I learned from Mandy, Yvonnne's Guest Designer. All the Best... What a wonderful sentiment. All the best in love, in fortune, in happiness. All the best in Life. This next card was my first attempt at the Nicotiana image. I had a friend very recently and unexpectedly loose her daughter (who was my age!). 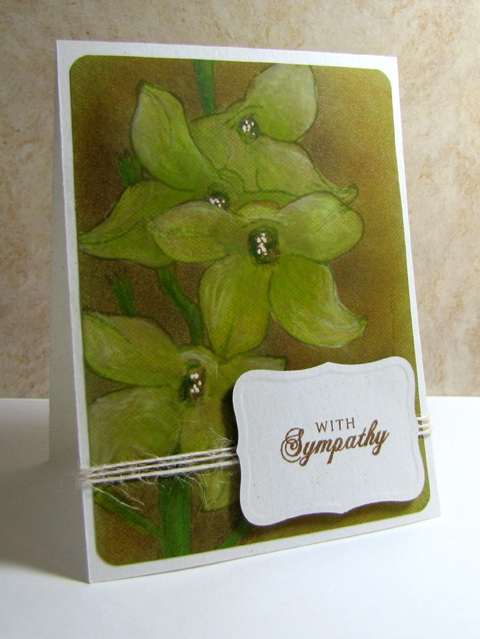 My friend is a gardener, not at all a flashy person and quite down to earth so I chose a more subdued color palette for this sympathy card. 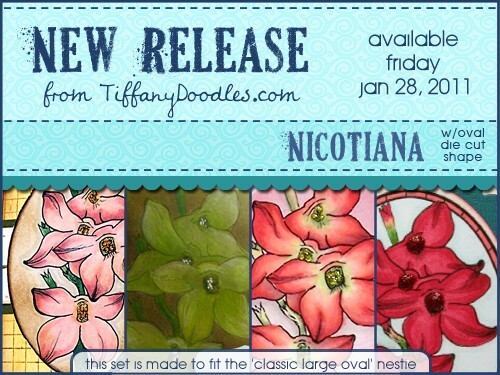 All three new flower sets will be available in the TiffanyDoodles Store on Friday the 28th. Buy all three sets and receive 10% discount through the weekend. Popping by with a quick card I put together after being inspired by this beautiful and regal pendant from Nanny's Room for the Etsy Inspired Challenge. I grabbed an this warbler image from TiffanyDoodles that has been sitting on my table for a long time-just waiting to be colored-then saturated the bird first with water from an Aqua Painter and then went back in with some pigment markers, removing excess colors with a cloth. 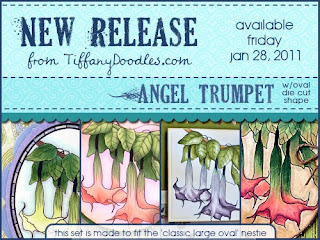 Tiffany is also sneaking another new beautiful flower image that will be available this Friday. So, I'd like to know...What's in Your World? First and foremost, they needed to be cute and they needed to be bright. They needed to reflect the joy of a new little boy arriving soon. They needed to have some kind of animal depicted to reflect my sister being a veterinarian. And lastly, they needed to be flat enough to mail mostly cross country. 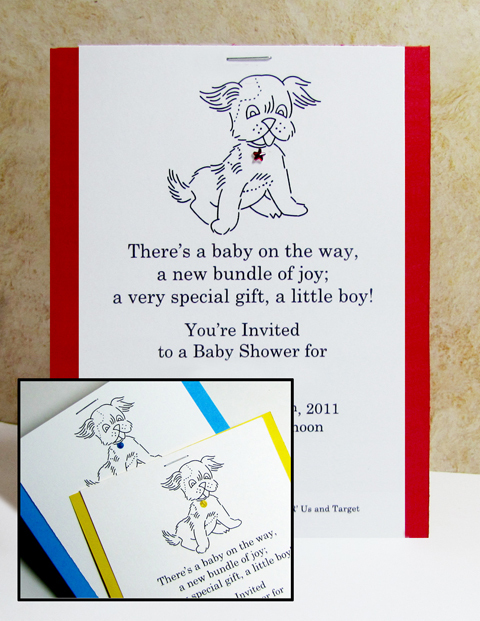 I started with this cute digital puppy image from TiffanyDoodles, added the text, printed four to a sheet and adhered them a quarter each to red, blue, yellow or green cardstock with staples. I finished with either a rhinestone or a dot of bright paint for the puppy's tag. 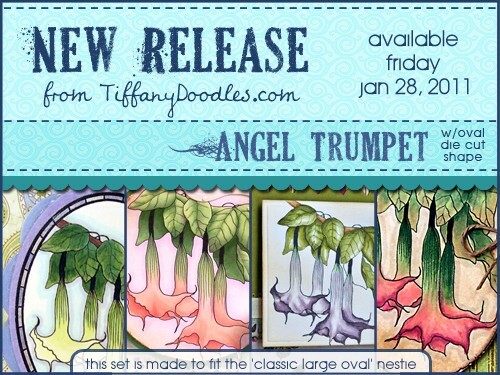 Tiffany is debuting three new images this week, here's a sneak of the first image. Pretty, right? The Chicago Bears host the Green Bay Packers today to hammer it out for the NFC Championship Title and a trip to the Superbowl-the two haven't met in this situation for 70 years! Although I'm not a Packer Fan, I do live in Wisconsin and it would be great to see our economy get the boost it needs if they win. So with that I say, Go Pack Go! Plus....Jing-Jing left a comment on a previous post that she would root for the Packers if I played along with the Color Room Challenge #42 this week! 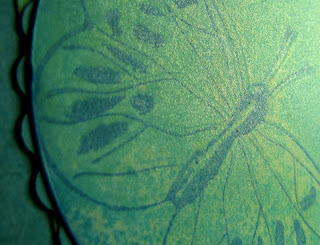 After stamping the butterflies in watermark ink, I applied a few colors of mist to an acrylic block, misted it with water and then applied it over the butterflies. 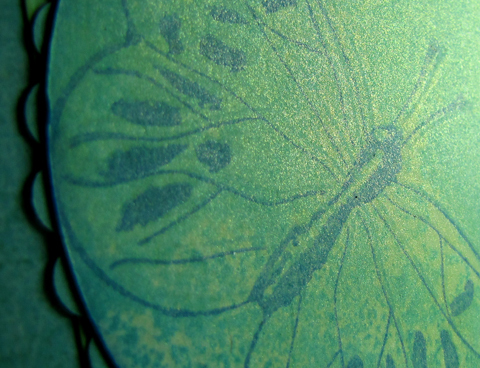 A neat effect for a background, but I wanted my butterflies to stand out a bit more for a focal point so I stamped over them in ink. 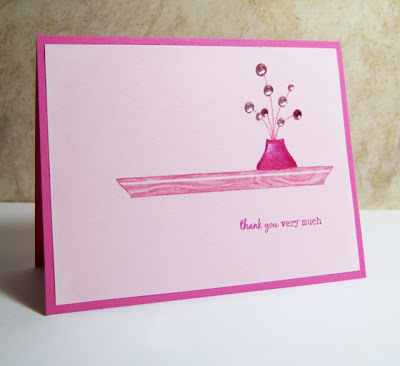 The rest of the card came together with a sketch from Skipping Stones Designs. 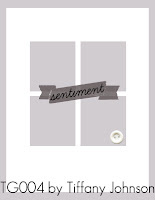 I chose a versatile sentiment is from Furnishing Fun by Schlosser Designs, I could send it out for a birthday or anniversary I think. 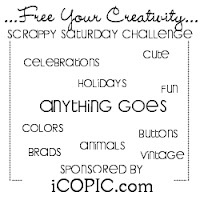 I really went out of my comfort zone here, tried a complex layout and new products, so I think this is a great fit to the Wee Memories Challenge: Free Your Creativity-Anything Goes. The set of chairs dueled day after day, facing each other, mostly not ever moving. Each had seats that were covered with pristine white wool supported by shiny mahogany wood. 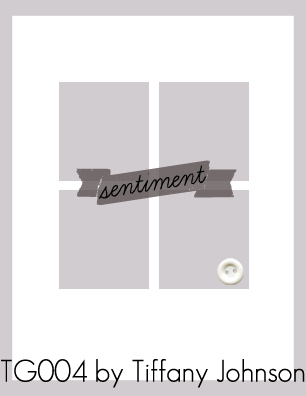 It appeared, to the tiny little girl peaking through the french glass doors, that the chairs would only move when they taunted her to get the other dirty and thus becoming the victor. Moxie Fab World's Color Inspiration for Card Makers Week: Bold and Bright Challenge was a perfect opportunity for me to try out an idea that has been running around in my head for ages with the chair pictured above, as the colors were a perfect backdrop for black and white. Before adhering the rubon to the patterned paper, I highlighted with white pen only certain areas, therefore reducing the need to fussy cut. Worked like a charm! The card is is finished with strips of solid pink paper as well as the innards of security envelops and a pink rhinestone by the sentiment to balance it out (a tip picked up ala Kelley). I honestly once studied the art of pinwheel making in screen printing class for my design degree (questionable as to if it was money well spent?). 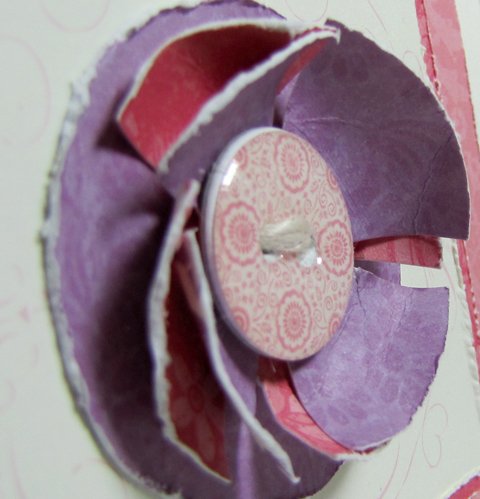 We were to screen twenty or so different designs and configure handmade pinwheels out of the best color and pattern combinations, a thumbtack and a #2 pencil. It was quite the sight to see eighteen twenty-or-so year old students blowing their pinwheels across campus! 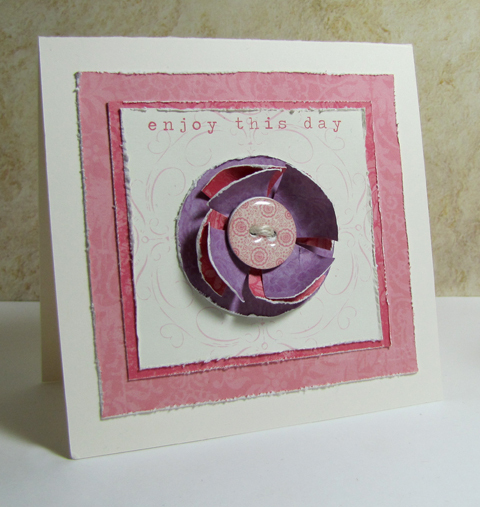 So I basically took the pinwheel concept and came up with a flower using the color combination from Moxie Fab World's Color Inspiration for Cardmakers Week: Pretty Pastels. I found some rare-in-my household pink and purple patterned paper and let it do all the work. 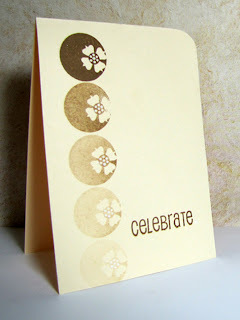 A first for me-no stamping! 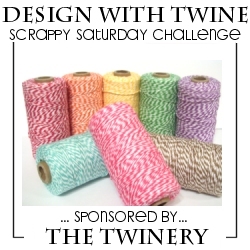 Mandy at Limelight Papercrafts has this fabulous sketch challenge and this week you can have a chance to win a prize of Basic Grey Sugar Rush Woolies if you participate and use chipboard! I'd love to see your interpretation of this challenge for sure. 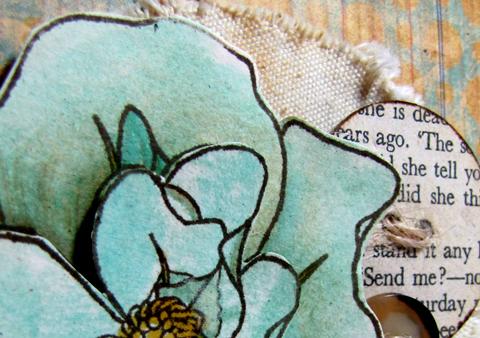 My card started with the negative image of a chipboard flower that I covered in paper. 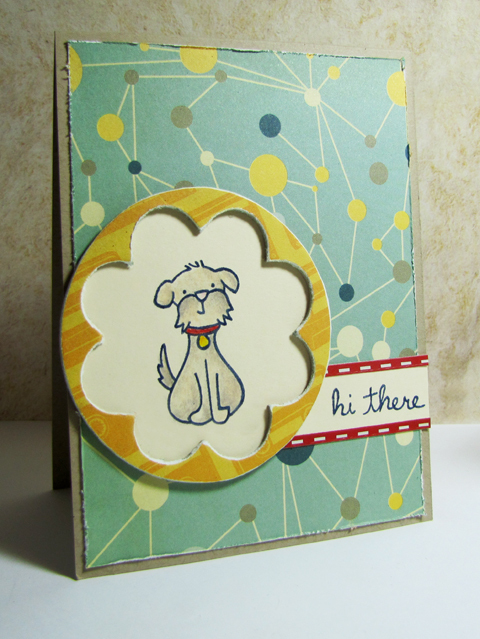 I stamped this cute puppy onto a panel and then glued it behind the chipboard piece. 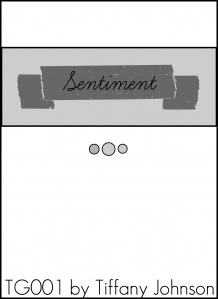 I slightly offset the big circle so I could have room for a sentiment. Limelight has some super amazing store closing deals-including sales on a few Lawn Fawn Stamp sets! She's the kind of girl that has manners down to a tee, but has a bit of a rebellious streak to her. She's the kind of girl that cuddles with her teddy bear every night, but builds ramps with the boys at school. She's soft and sweet, but knows that she can be herself and do whatever is on her mind...I'd like to call her the Gilded Girl. 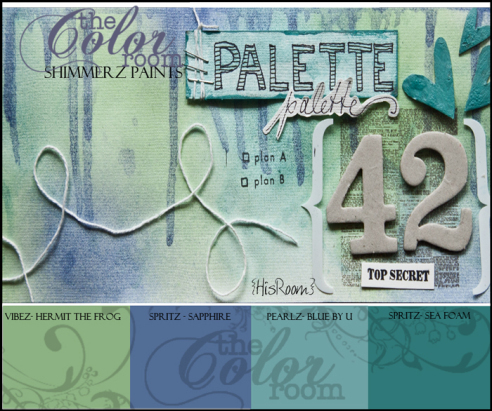 It is my goal to participate in all of Moxie Fab World's Color Challenges, and some are more difficult to me than others. 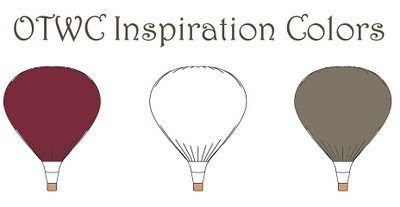 Take for instance, this Color Inspiration Week's: The Metallic Challenge. Yeah, giiiirrrrrlllllll colors (saying that like my boys do, and how to them girls might just be the kiss of death). I don't have any girls (but if I did, I think she would be a Gilded Girl) therefore I hard a hard time combining gold and pink together. But I appreciate the challenge for the challenge and I have a thank you to send out. Outside of their births, only one time did my babies have to experience a hospital visit. Thankfully, it only amounted to a lot of eaten gum. Breaks my heart to think of all the children that spend more time in a hospital than in their homes. 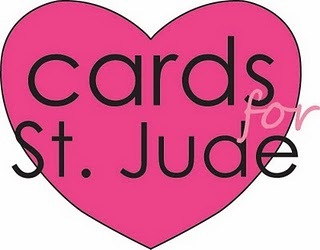 Winter is having a card drive for the children of St. Jude in which you can read about here, and TiffanyDoodles is one of the sponsors. Today there is a mini blog hop featuring TiffanyDoodles Valentine's images, please stop by Tiffany, Kim, Collette and Jeannie's blogs! This card couldn't have been more simple to make. 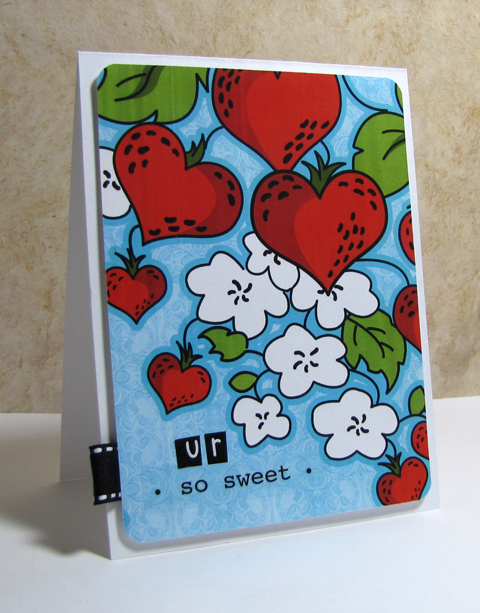 I printed out one of the amazing Strawberry Hearts Digi Papers, rounded the edges, added some sticker sentiments and a ribbon tab (I'm into that kick again) and mounted it to the card base with foam adhesive. 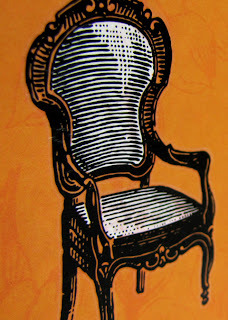 "Art Nouveau's identifying visual quality is an organic, plantlike line. or flow with elegant grace as it defines, modulates and decorates a given space. were frequent motifs from which this fluid line was adapted." 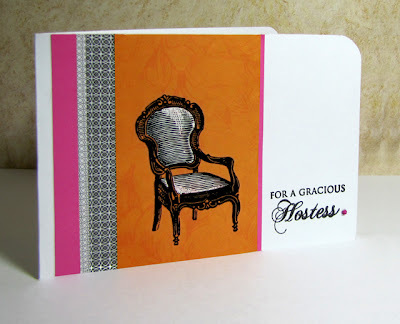 For my entry into the Moxie Fab World's The Gray is the New Black Challenge I started by printing in darker tone of gray a digital image onto textured gray cardstock and then colored areas lightly with colored pencils. 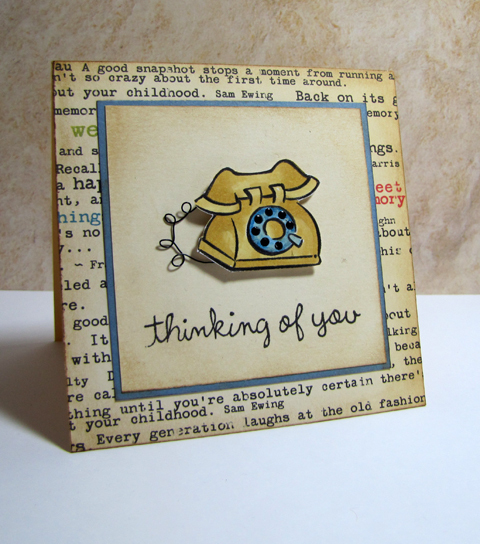 I then added enamel accents in both black and white and finished the card with a sentiment panel. While my card doesn't necessarily reflect the bright colors from the period in Graphic Design history, I'm happy that I think I captured its essence. She's always got clean sheets on the bed, toys in the bin, fresh baked chocolate chip cookies, a spot for a large dog and Lucky Charms for our breakfast of choice! She's always on top of things when we invade for a week or more and I couldn't appreciate more. Thanks Mom, for being a Gracious Hostess. 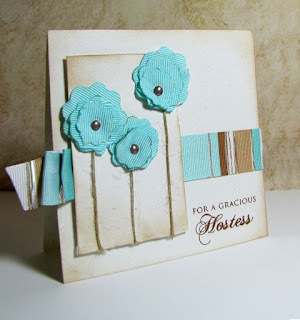 The super talented and super sweet blogger Jen has a really great tutorial up over at the May Arts Blog on Burnt Ribbon Flowers. I decided to try my hand with it and like the results. 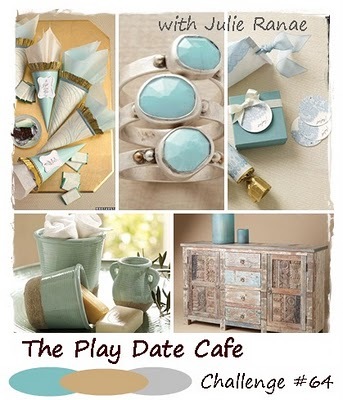 The colors of the card were inspired by The Play Date Cafe. Just a few clean and simple baby thank you cards I've made for the upcoming arrival of Baby Dot (no, he's not mine, but my sister's!). 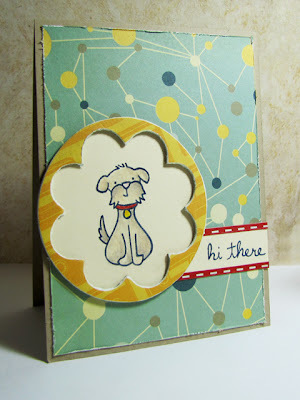 I gained inspiration for the layouts based on Tiff's Sketch here (instead of the three dots, I used made the whole background polka dots), and used all sorts of twine from different manufacturers for added interest, and because the Wee Memories Challenge reminded me to pull some out of my stash and actually use some! 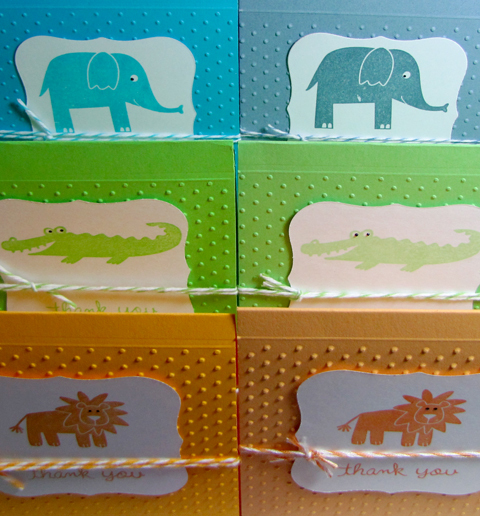 The left side is the bright palette (brighter paper and brighter twine), the right side a bit more subdued. 1. I read most magazines from the last page to the first. Except for Papercrafts-then I page through first to see how many names I recognize. 2. "The boys" made me a pink spinner bait last night to go along with my birthday present of a pink fishing rod and reel last October. I'm really, seriously forward to packing a lunch for the four of us and catching some fish-that is, when the ice on the lakes melt. I don't do ice fishing. 3. I live in a house with one bathroom and no dishwasher or basement, but it is HOME and I'm so very grateful to have a roof over my head and two little and one big boy to share it with. 4. A few days back I read an article that babies born this year will not know what landline phones, DVDs, newspapers or printed maps really are. These children will miss out on some fun stuff, and, it makes me feel old. 5. I recently discovered delectable tastes of pomegranate and clementines...and saddened to discover that they are only available in Central Wisconsin (at a price I can afford) during the Christmas season. 6. Young Riders (the 1980's cowboy show featuring The Pony Express) is my new favorite TV show. It is not only a classic, but a great excuse to have a "Date Night" frequently and in our own home. Thank you Netflix. 7. Looking forward to seeing my son wrestle this weekend, hoping to see the joy on his face when they hand him a medal, and praying that he is strong enough to realize that winning isn't everything should he not receive one. 8. 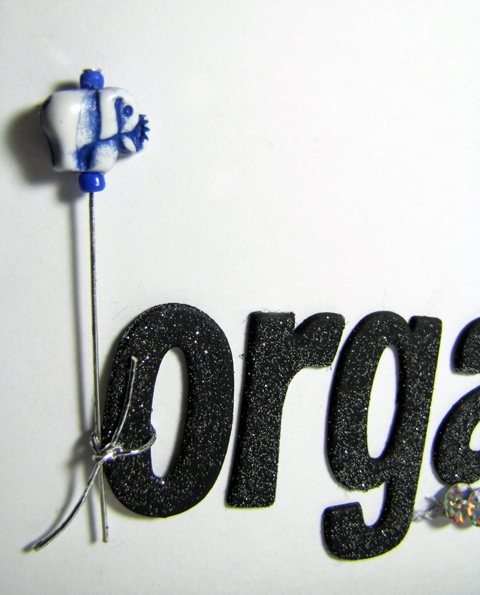 And lastly, been feeling in a crafty rut these past few days. I. need. to. escape. this. rut. 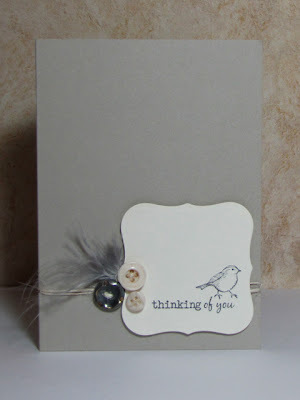 I am also trying to expand my crafty ways, but keep coming back to clean and simple. Hope you don't get bored. Getting organized has always been a difficult thing for me. I struggle with even remembering to be organized! 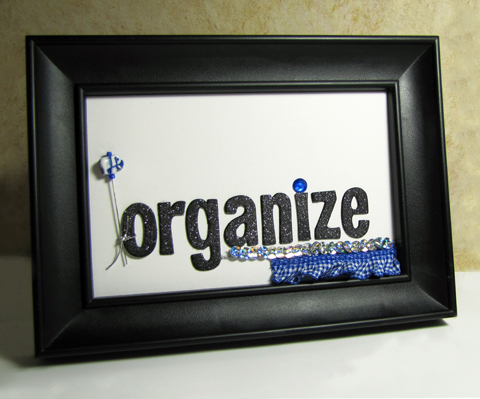 I created this little frame to as a constant visual reminder to get organized! I'm so excited to have been invited to do a feature over at Gauche Alchemy! I won a few of their Mixed Media Kits from the very talented Yvonne's blog, and they are so much fun to sort through and come up with something creative. So please hop on over to the Gauche Alchemy Blog for a bit more details and check out their Mixed Media Kits here! Remember, an elephant never forgets! 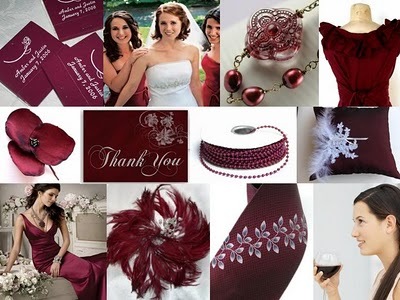 Cranberries, the glossy shiny gems of burgundy red become a focal point for her winter wedding decor. A few days before the big event, she convinced her future husband to trek through the long driveway of the marsh, full of snow, with her to pick up a crate of fresh berries to adorn their reception tables. Thousands of glorious, elegant, unmarred burgundy red beads held together by rustic, worn wooden slabs of wood...what a perfect couple. Oh, the colors of Off the Wall Craftiness brought back so many tucked away memories of my very own wedding. 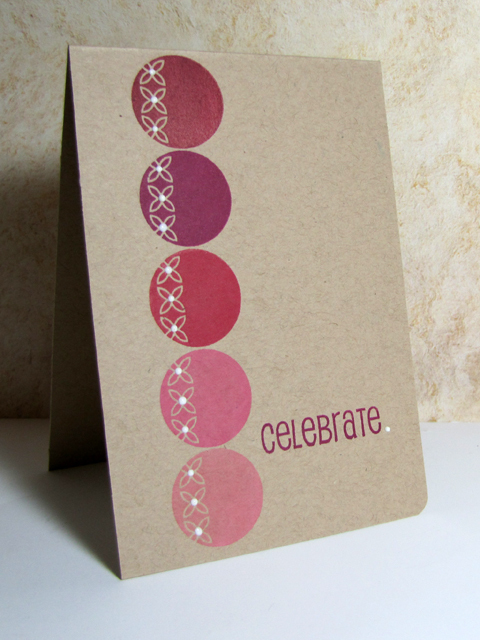 I started by stamping a series of patterned circles from Schlosser Design's Circle-A-Thon repeatedly in burgundy shades of chalk ink onto kraft paper and then added white enamel accents (these are so awesome, by the way!). I liked the design and concept so much that I decided to take on the Winter White Tuesday Trigger Challenge at Moxie Fab World, this time using the stamping-off technique of brown ink onto cream paper. 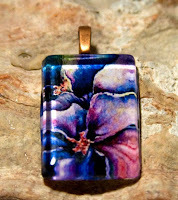 White enamel accents were also added, although the photograph does not show it well. Vintage snow. It's the kind that comes with the first substantial snow fall of the winter. It's the snow that transforms into a glittery sheet of wonderful. It's the kind that remains untouched for three months by little boys, big dogs, snowplows or a wave of a warm weathered day. Yes, that's vintage snow. I really wanted to play along with the first ever Lawnscaping Challenge and decided on a birthday card because I have yet to acquire the cute Lawn Fawn Critters in the Snow or Frosties set. I combined vintage with snow by pairing painted and stickled chipboard candles with lace and the cute sentiment from Sophie's Sentiments. I'm also really trying to use different supplies and try out different styles in this new year. 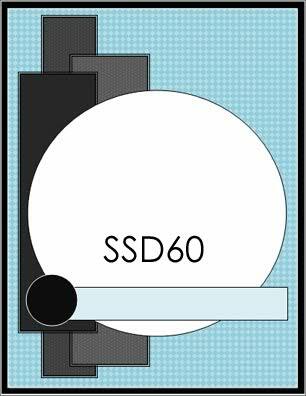 The sketch for this layout came from Get Sketchy! Love the possibilities of it too! 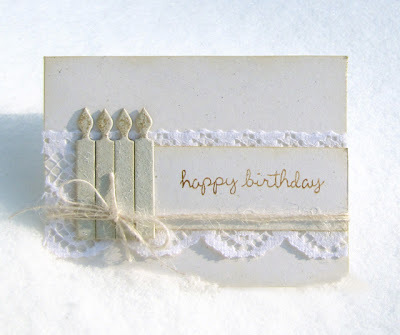 Thought I'd take a chance and brave the sub zero degree weather to photograph the card in some of the above said snow.